David Santandrea, solo classical guitarist, will provide your event with a collection of fresh and lively instrumental classical songs. David Santandrea began playing guitar at age 7 and has continued to delight with his music ever since. His most recently released self-titled album, David Santandrea, is a fresh and lively instrumental classical collection of songs, yet he also dabbles in rock and roll, funk, r&b, and jazz. In the late 70's and early 80's Santandrea toured Canada with his band, Charrington, fronting the four-man band as lead vocals and guitarist. 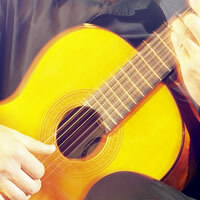 Currently, Santandrea performs a solo, classical guitar set for special events happening in Ontario.